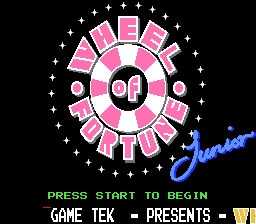 Play Wheel of Fortune Jr. Edition Now! Gametek just took their first Wheel of Fortune creation and renamed it, and changed the prizes around. Barely anything is Junior about this game. Spin the wheel, buy a vowel, or solve the puzzle. When you get to the bonus round, if you get there, always pick "R, S, T, L, N, E." These are the most common letters and they'll always give you a decent chance (this game was made before the rule where you automatically got those letters).